Please contact the owner directly @ 616-292-0969 or ryan@capstonefinancialclients.com..2008 MasterCraft CSX 265 purchased ne in winter 2010. Has twin Indmar 6.0L engines producing 800HP. Has the X-Sport package which includes a T-Top, Console and Motor Box Upgradeincreases seating, Electric Pedestal Table in front that creates a picnic area, GPSVHS Chart and Marine Radio, Console Covers, Rod Holders, 2,800 Custom Cover that protects the whole boat from the sun and elements, Center Console creates a better view for water sports and fishing, Automatic Head and sink in bathroom which can also be used for changing, MasterCraft Tandem Axle Trailer included, Always kept on lift in the summer under cover and heated storage in the winter, 150 hours on engines, Yacht Certified which means you decide how many people you can have on board. 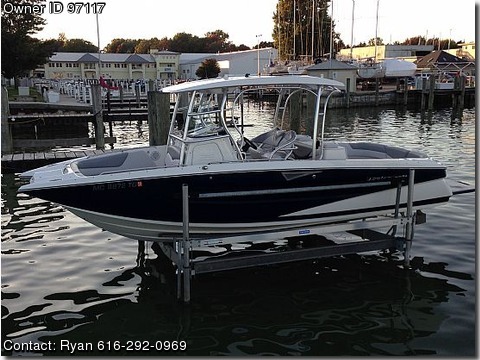 If you could create a boat that offers the whole family and friends everything in water sports and fishing combined, this is it Have had other MasterCrafts in the past including a 230 and a X-45 this has been the most versatile and fun. This boat retailed for 170,000 in 2008. This boat is like new, never has seen salt water. Please call my cell phone to discuss and pictures.